DETROIT (AP) - Hundreds of items that belonged to civil rights icon Rosa Parks and have been sitting unseen for years in a New York warehouse were sold to a foundation run by the son of billionaire investment guru Warren Buffett, the younger Buffett said Thursday. 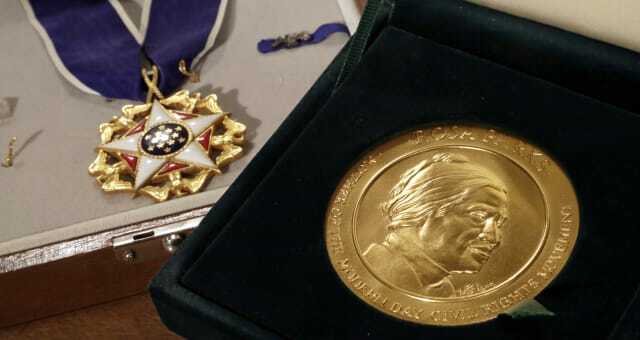 Howard G. Buffett told The Associated Press that his foundation plans to give the items, which include Parks' Presidential Medal of Freedom, to an institute or museum he hasn't yet selected. Buffett said the items belong to the American people. "I'm only trying to do one thing: preserve what's there for the public's benefit," he said. "I thought about doing what Rosa Parks would want. I doubt that she would want to have her stuff sitting in a box with people fighting over them." A yearslong legal fight between Parks' heirs and her friends led to the memorabilia being removed from her Detroit home and offered up to the highest bidder. Parks, who died in 2005 at age 92, was one of the most beloved women in U.S. history. She became an enduring symbol of the civil rights movement when she refused to cede her seat on a Montgomery, Alabama, bus to a white man. That triggered a yearlong bus boycott that helped to dismantle officially sanctioned segregation and helped lift the Rev. Martin Luther King Jr. to national prominence. Because of the fight over Parks' will, historians, students of the movement and the general public have had no access to items such as her photographs with presidents, her Congressional Gold Medal, a pillbox hat that she may have worn on the Montgomery bus, a signed postcard from King, decades of documents from civil rights meetings and her ruminations about life in the South as a black woman. The impetus for the sale came earlier this year when Buffett saw a televised news report about how Guernsey's Auctioneers has kept Parks' valuables in a New York warehouse since 2006. "I could not imagine having her artifacts sitting in a box in a warehouse somewhere," Buffett said. "It's just not right." So he directed the Howard G. Buffett Foundation to make an offer, which was accepted. A purchase agreement was signed over the summer, and the transaction was officially closed last week. Buffett would not disclose the amount he paid for the items, but Steven Cohen, a lawyer for the seller, the Detroit-based Rosa & Raymond Parks Institute for Self Development, called it "quite generous" and "consistent with (the items') intrinsic and inherent value." In addition to medals and letters, the lot includes lamps and articles of clothing. Guernsey's years ago put together a complete inventory, which is 70 pages long and includes more than 1,000 items. Many are in New York, but some remain in Parks' home city of Detroit. Guernsey's President Arlan Ettinger, who had valued the collection at $10 million, would not say what it was sold for, but said the judge overseeing the Parks estate was satisfied with the deal. "This material, which needed to be out there to be both educational and inspirational to people today and their children's children, was sitting in our warehouse. That was wrong," Ettinger said. Buffett, a philanthropist who focuses much of his giving on helping fellow farmers in developing countries, acknowledged he probably was not the most likely candidate to buy Parks' memorabilia. "My wife said, 'You don't do that sort of stuff.' I said, 'I know, but it's important,'" Buffett said.